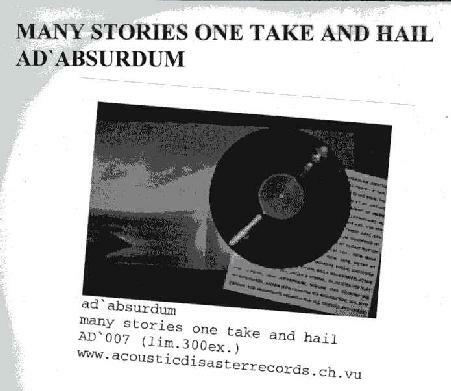 Ad`Absurdum - "Many Stories one Take and Hail"
Ad`Absurdum are quite an old band form Switzerland and they have 7 releases dating back to 1997 before this limited edition vinyl of only 300 copies. I first heard the band on Myspace, where I was totally blown away by the space rock jam that started their music player. The LP has 6 all instrumental tracks on it. On the first two tracks, Sie Suchen #2 and Flowers (features some very beautiful violin), the music is in this post rock vein like Mono, God is an Astronaut and God Speed you Black Emperor style, but they like to get a little more spaced out and Flowers gets quite heavy at the end. Ernakulam Junction ends side 1 and is over 10 minutes. It begins with some very nice piano before the rock groove kicks in and the track really takes off. The way the organ is played at the end reminds me a lot of Brainticket! Rush Hour Daydream, begins with mostly piano and is indeed very dreamy, but then the dream takes a weird turn half way through the 9 min track and the band really take off into some kraut style space rock sounds. Awesome stuff. L'Acienne Poste begins very slowly and features organ instead of piano, as most of the tracks have and it also builds up but is not quite as spaced out but has a pretty heavy distorted guitar sound. It feels like bodily bones are shivering like leaves in the wind, ends this pretty cool LP. This track is quite strange and features banjo but it is a nice way to end the record. I hope I can hunt down some more of this bands music but all their releases are sold out except for this one and some have been released in as few as 50 copies! For more information you can visit the Acoustic Disaster Records web site at: http://www.acousticdesasterrecords.ch.vu.